The distance to Santa Cruz is indicated in kilometres on the median barrier of the motorway. 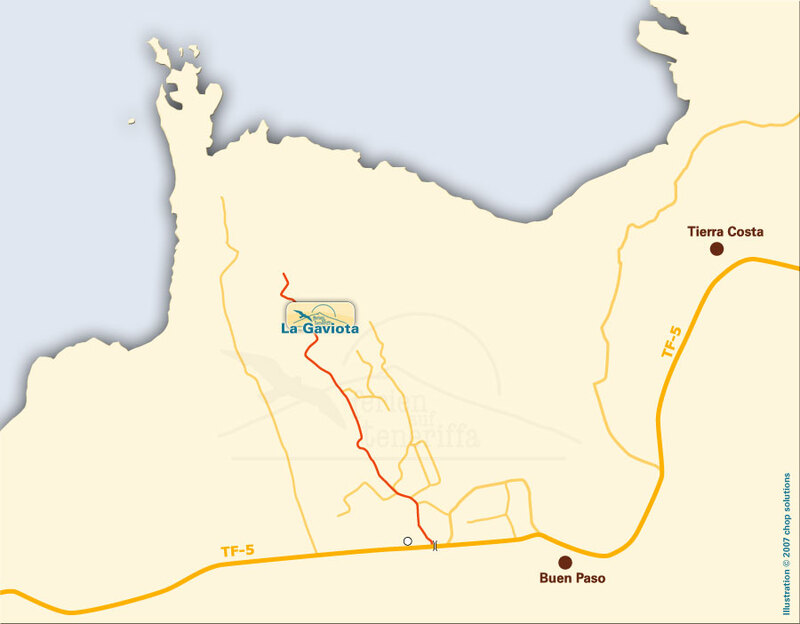 You drive along the motorway until kilometre two; there you turn off in the direction to Puerto de la Cruz (TF5). If you then are on a new four-lane motorway and drive uphill, then you are right. You pass the exit Puerto de la Cruz and stay on the motorway until it terminates. The motorway turns into a rural road. 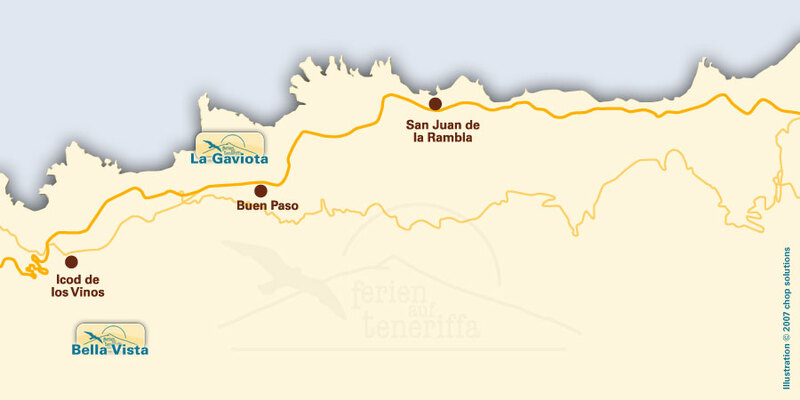 You keep driving on this road (TF5) and then pass through a small town called San Juan de la Rambla. Having passed San Juan de la Rambla, you will arrive in a small village called Buen Paso. There you keep driving on the main road until you pass through a small pedestrian bridge. Immediately after the bridge turn right into a small road. This road will lead down to the sea. You keep driving downhill about 900 metres until you notice a red building on the right side of the road. Then you are already there. The name Kaufmann is indicated at the main entrance. Behind the pedestrian bridge in Buen Paso you will see a Red Cross building and a helicopter landing field on the right side of the road. The small road to our house lies between the bridge and the building. My name is Roberto Kaufmann Yanes. You can reach me under 922 811910 or 619 986743. If you get lost, do not hesitate to give me a call. There are phone boxes everywhere. If you bring a cell phone along, you just need to dial the numbers indicated above. Dialling codes are not necessary. The supermarkets are open from Mondays to Saturdays from 9.00 am till 9:30 pm. In tourist areas the shops are also open on Sundays. If you request more information, do not hesitate to give me a call!